Yann Guichard and his crew started their world tour at Ushant today, Wednesday, January 16 at 11h 47min 27sec UTC. 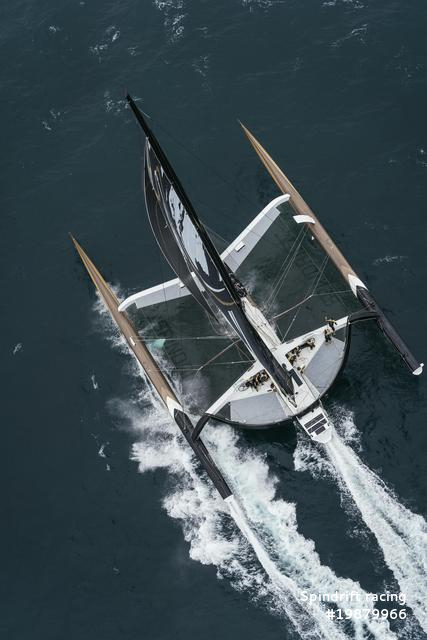 To win the Jules Verne Trophy they have to recross the line by February 26 at 11h 16m 57sec UTC to break the record, held since 2017 by Francis Joyon and his crew, of 40 days 23h 30m 30s. The weather conditions were favourable at the Créac'h lighthouse, which marks one end of the start and finish line of the Jules Verne Trophy course, the round the world sailing record via the three Capes. 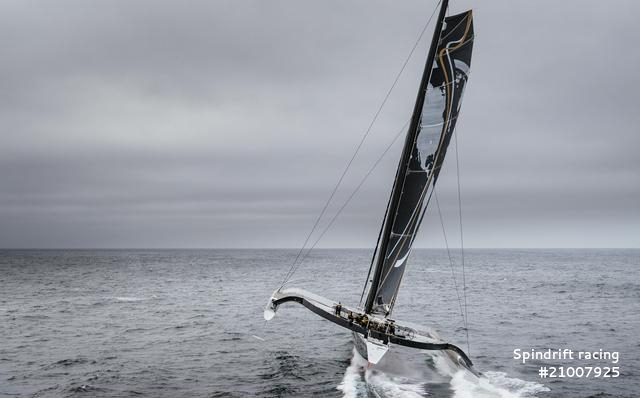 A southwesterly breeze of 20 knots and calm seas allowed the giant black and gold trimaran to head quickly towards a front off Ushant and pick a good system from the north-west. 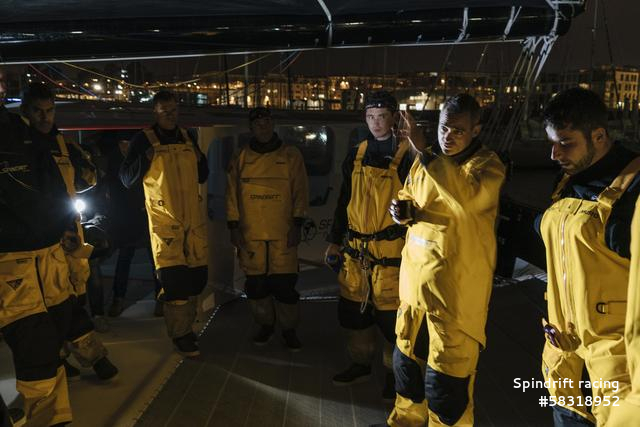 It is these strong winds that Spindrift 2 will be able to pick up to take them quickly down to Madeira, the Canaries and the Cape Verde archipelago. A record at the equator? 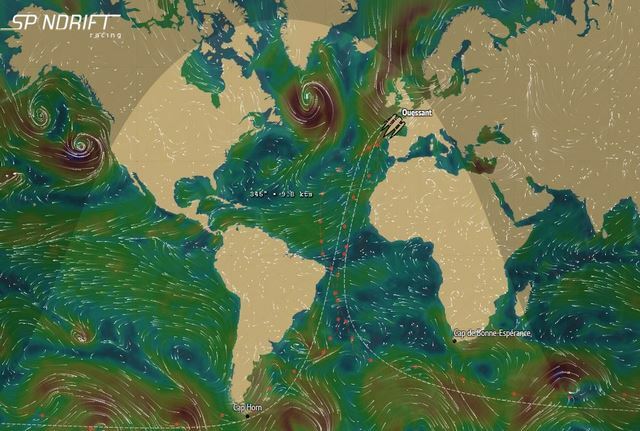 According to the routing of the team's onshore weather router, Jean-Yves Bernot, the team could reach the equator during the night of Sunday to Monday, January 21, after less than five days at sea. Once over this imaginary line between the two hemispheres, Yann Guichard and his crew must continue to speed on, with the aim of crossing the longitude at the Cape of Good Hope in about twelve days. 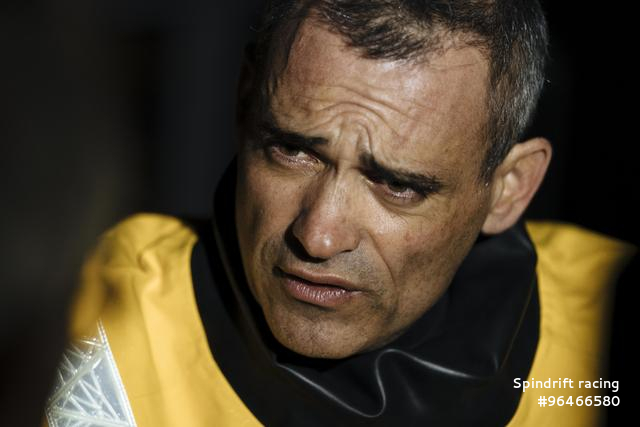 This challenge is very possible as Francis Joyon and his crew reached the African cape in 12d 21h 22m. 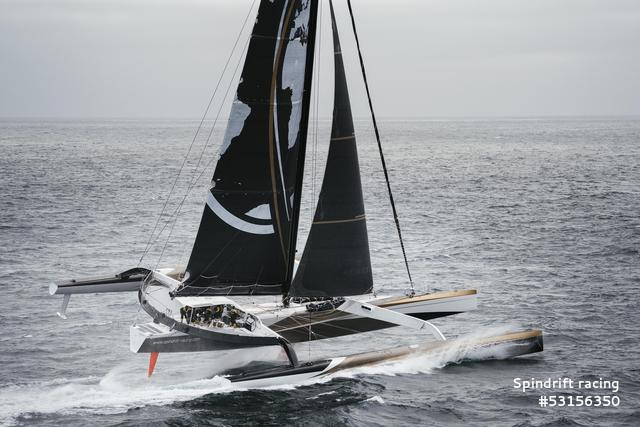 By adding all the best reference times since the first attempt on the Jules Verne Trophy in 1993, the crewed world tour from Ushant to Ushant could potentially be completed in 38 days. The first stretch towards the equator looks very favourable, but it is still too early to anticipate what follows. If a depression moves away from Brazil during the passage off Salvador de Bahia, the weather configuration could allow the team more options to sail more directly towards the South without having to go around the St. Helena anticyclone. Afterwards it will be the depressions to the south, their trajectories, north-south positioning and speed that will determine if the Indian Ocean can be crossed in less than 5d 21h 08m and the Pacific in less than 7d 21h 13m. "It looks good up to the equator! The trade winds are well established: it should take less than five days. Then there are still the unknowns in the southern Atlantic but we hope to reach South Africa in around twelve to twelve and a half days. This world tour is also a passing of the seasons at high speed! We start in the north-west with drizzle, then in the Canaries we will be in the trade winds with 30°C, at the equator it will be 40°C and three days later, we are in the Forties, in the Southern Ocean with three fairly steady and fresh weeks. It's a nice trip. One of the difficulties is the Saint Helena High in the southern Atlantic, which can sometimes block the road. It is not a problem to go round it if there is wind because the latest boat is going fast. In the Southern Ocean, it is still at least a fortnight of cold, wet weather but there are also magical landscapes and an incredible place to experience as a team. We are a slightly lighter than the last time, which is why we are only twelve onboard. Below twenty knots we have a very slight speed deficit, but anything above that Spindrift 2 is faster than before! We can keep our average speed above 35 knots, if the sea remains manageable."